A collection of 13 liturgical songs from one of the most beloved composers of music for worship. This collection contains several psalm settings, two Alleluias, a Creed, a Lamb of God and more. The songs can be used by virtually any parish regardless of its musical resources. Bernadette Farrell's journey with liturgical music has been a long and trusted one. Since the 1980s she has been composing music for the Church. Many of her songs were originally written to meet a local need and have since become nationally and internationally known and used. All are prayers of praise and petition. Christ, Be Our Light includes the well-known title track, one of the most popular liturgical songs of all time, as well as several psalm settings and songs for various specific parts of the liturgy. The songs were composed to be usable by virtually any parish, regardless of its music resources. The 13 songs include music for liturgy, RCIA, confirmation, gathering and procession, Baptism, Vigil services and more. 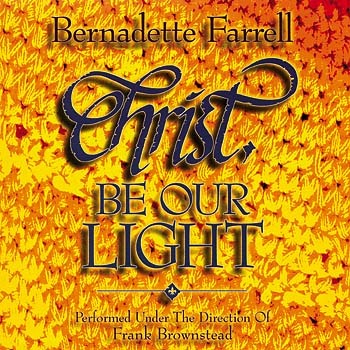 With texts drawn from Scripture, the saints and Bernadette's personal experiences, Christ, Be Our Light offers music that has truly found its way into the collective memory over time.